Mixed berry jam is perfect for this time of year. The strawberries are just wrapping up for the season, the raspberries are abundant, and we’re starting to see some blueberries on the low bushes. None have appeared on the high bushes, but they’ll be here before we know it. This is the recipe I make, but feel free to change up the berry ratios for what happens to be available in your neck of the woods. This recipe uses Pomona’s Pectin. If you’re not familiar with how to use Pomona’s you can read about it here. If you don’t have Pomona’s, you can use Ball or Sure-Jell, but you may have to play around with the sugar ratio. Fun tip: Before you start the jam-making process, stick a spoon in the freezer. When you think you’ve got the jam about right, pull the spoon from the freezer and dip it in. The cold spoon will chill the jam quickly, giving you a good idea of how thick it will be after canning. 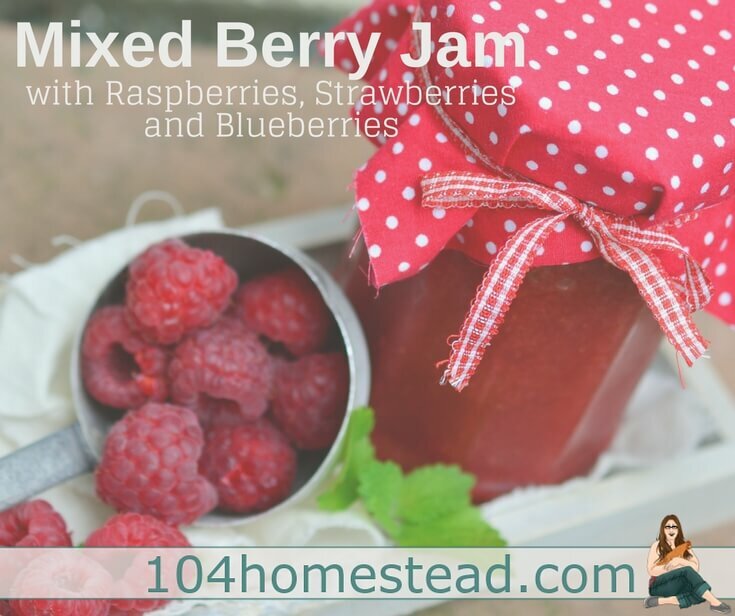 If you plan to can your jam, prepared the water bath canner, jars, and lids. If you have any questions about water bath canning, check out our FAQs and recipe guide. This recipe uses Pomona’s Pectin. Pomona’s is a sugar free, preservative free, low-methoxyl citrus pectin is specially formulated for making low sugar jam & jelly. It’s vegan, gluten-free, and non-GMO. This recipe can be used with traditional pectin if you prefer. Simply follow the directions on your pectin’s box. Wash and prepared your berries. You’ll need four cups of lightly mashed raspberries, two cups of quartered strawberries, and one cup of blueberries left whole. Add all your berries to a shallow stock pot/spaghetti pot. 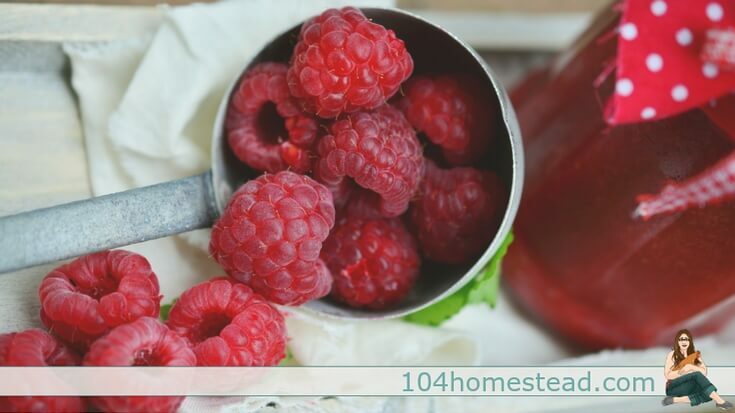 Add in your calcium water (if using Pomona’s) and lemon juice, then mash your berries with a potato masher. They don’t need to be fully mashed, but this helps the process later on. Mix together your sugar and pectin with a fork and set aside. This applies to whatever pectin you’re using. Once your jam is boiling, stir in your sugar/pectin mix. Stir for 2 minutes so the sugar and pectin melt and are well incorporated. To check if your jam is ready, dip in the frozen spoon. This should give you an idea of the final cooled consistency. Too thin? Boil a bit longer and check again. Remove jam from heat and assemble your canning assembly line. Don’t forget to sterilize your jars before filling. This can be done by boiling them in the canner for 10 minutes prior to filling or using the sterilizing function of your dishwasher. Fill your half pint jars (you can use the smaller jam jars, but obviously you’ll been more than 8), leaving 1/4″ headspace. Wipe rims clean and add lids and rings. Remember to have your rings finger-tight. You don’t need to be the hulk putting on those lids and it won’t process correctly if they’re too tight. Be sure you haven’t included the lid grabber magnet… Add your filled and lidded jars to the canner and process for 10 minutes. Allow your jars to cool and check the seals. That’s it! You now have the flavors of spring berries in a jar to enjoy all winter long. 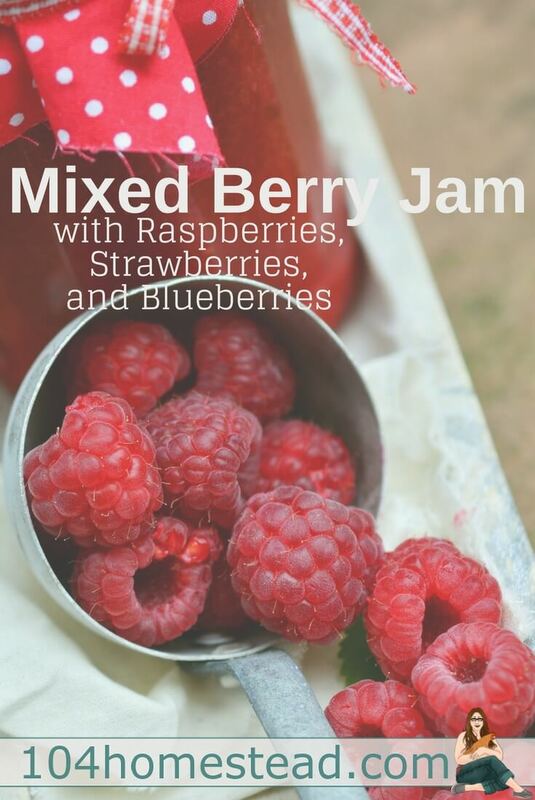 Mixed berry jam is perfect for the spring when all the different types of berries are starting to arrive. Wash your jars and lids in warm soapy water and rinse well. Place the canning rack into the water bath canner, set the clean jar into the canner, add water, and boil jars for 10 minutes to sterilize. Wash and prepared your berries. Lightly mash raspberries. Quarter strawberries. Blueberries can be left whole. Add all your berries to a shallow stock pot. Stir in calcium water and lemon juice, then mash your berries with a potato masher. They don’t need to be fully mashed, but this helps the process later on. Mix together your sugar and pectin with a fork and set aside. Warm berries on medium/low for 3-5 minutes and then blend the mixture with an immersion blender. Keep blending until you reach the level of smoothness you like to see in your jam. Raise the heat to medium/high and bring it to a full boil. Once your jam is boiling, stir in your sugar/pectin mix. Stir for 2 minutes so the sugar and pectin melt and are well incorporated. Remove completed jam from heat. 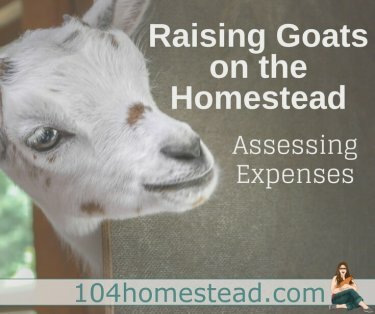 Fill your half pint jars leaving 1/4″ headspace. Wipe jar rims clean and add lids and rings. Add your jars to the canner and process for 10 minutes. Allow your jars to cool and check the seals. Pomona's Pectin is a sugar free, preservative free, low-methoxyl citrus pectin is specially formulated for making low sugar jam & jelly. It's vegan, gluten-free, and non-GMO. This recipe can be used with traditional pectin if you prefer. Simply follow the directions on the pectin's box. Remember, you can use any ratio of mixed berries that floats your boat. Be creative. You can also switch out the sugar for some honey if you prefer. My guess is you’d want about 3/4 cup of honey to replace the sugar, but I haven’t tried it myself. You could even add a little vanilla bean. Yum! Let me know what you think of this recipe and share how you added your own personal touch in the comments below.